In terms of nobility, of character, of even resolve in defending the traditions she believed in, Hawa Dramé is without a doubt an 'old school' griot. Born in Niono, Hawa started singing for an audience - not unlike many of the Great Griots from Mali - as a young girl, at the age of six. In an impressive career, which not only brought her national fame through her membership of Mali's Ensemble Instrumental National but also international recognition, she was both a fantastic singer and also a researcher into the vestiges of bambara musical culture. 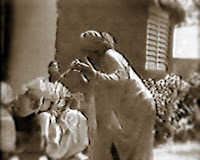 As such she was in turn a source of inspiration for others, - like the Super Biton orchestra, which converted many of the traditional themes (or 'rhythms', as they are often called in Mali) made famous by Hawa Dramé into modern orchestral pieces ("Lefenin", "Sodanso" and others). In my opinion there is no better proof of Hawa Dramé's talent than this cassette, which consists of songs recorded by the ORTM. At least three of the five songs were originally recorded for television. The first of these, "Djandjon", I have posted earlier. The cassette was released* in the late 1980s, but I am assuming the television recordings were made a few years earlier. My favourite song of this cassette, and perhaps even my favourite song by Hawa Dramé, is the monumental version of "Mbaoudi". The song starts with a two minute instrumental introduction by a choice selection of Malian instrumentalists, with Bouba Sacko (ngoni) and Tata Bambo's husband Modibo Kouyaté(guitar). 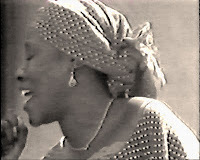 Then, Hawa Dramé takes command of the song. She does so in a way which leaves no doubt about who is in charge. She is the singer and the group is there to follow her lead. Although the accompagnement is quite loud, she has no problem staying on top. In tracks like "Hinebe Delila" and "Djoba" Hawa Dramé shows the value of an aspect which many of the present-day artists from Mali seem to have forgotten. 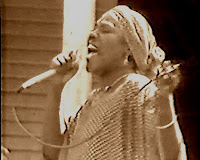 Instead of going 'full-blast' throughout the song, she alternates a more intimate singing style with more forceful passages. But all her songs have one thing in common: they are all 'posé', with an almost striding rhythm - and a matching regal voice. I have delayed posting this cassette to find a way to add this wonderful twelve minute (i.e. too long for YouTube) video of "Noumou Foli". This ode to the blacksmith patrons (by the name of Ballo) of Hawa Dramé's family is also on the cassette, but breaks off after six minutes. In the video, which is the same recording as the cassette, the full version (well almost....) of this great song can be heard. * and I have been assured this was done without the consent - or even knowledge - of the artist! I wanted to ask if Hawa Drama could be the mother of Majari Drame, young griots of Bamako and wife of Modibo 'Le Gaucher' Diabate (great guitarist). Never too late to thank the beauty.